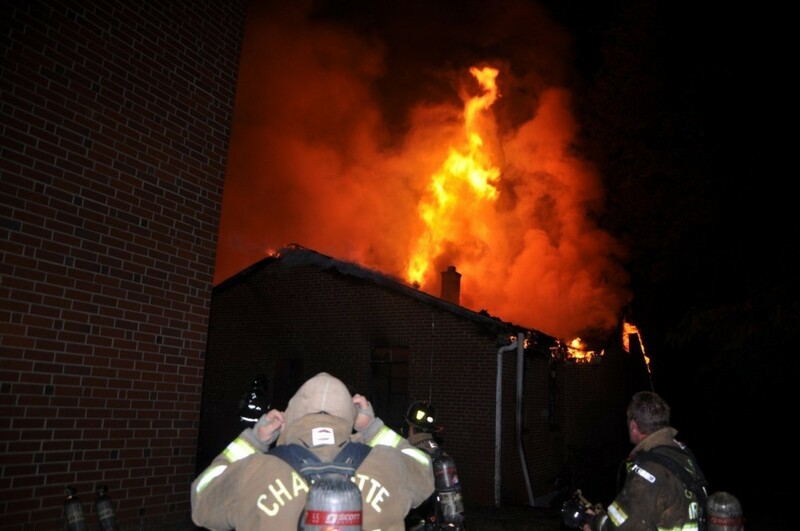 A fire that engulfed a small, predominantly black church in Charlotte was set on purpose, local officials said Wednesday. Now they are trying to determine whether the act of arson was a hate crime. The 911 call came in just before 1 a.m. on Wednesday, an urgent report from a resident of a nearby apartment complex. Within half an hour, more than 75 firefighters had responded to the three-alarm blaze. Flames leaped through the roof of the church complex’s central building, and smoke billowed into the darkness. Coupled with the already feverish temperatures of a North Carolina summer, the heat from the fire was overpowering. It took over an hour to get the blaze under control — by then it had caused more than $250,000 worth of damage and completely demolished the church’s main building, which housed classrooms. 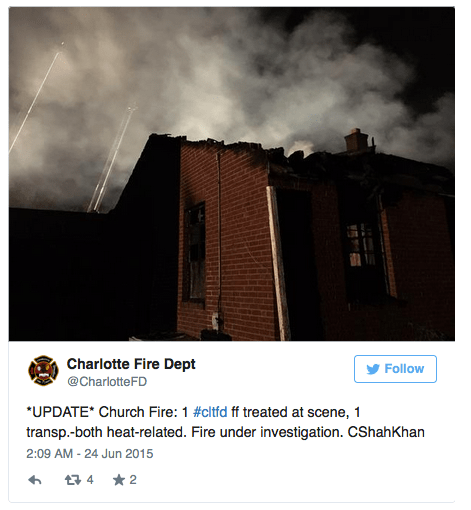 No civilians were hurt, though two firefighters suffered mild heat-related injuries, according to Charlotte Fire Department Public Information Manager Cynthia Robbins Shah-Khan. With the flames put out and the church reduced to a smoke-stained wreck, investigators determined around midday Wednesday that the fire had been intentionally set. What’s not clear is why. According to Shah-Khan, a hate crime is one of the possible explanations, though it’s not the only one. According to the Charlotte Observer, the Briar Creek Baptist Church is a small congregation of about 100 people on Charlotte’s east side. It shares a tree-lined, suburban-looking street with modest, single-family homes and a small apartment complex. Its pastor and co-pastor, Mannix and Rhonda Kinsey, are both African American, as are most of its parishioners. That wasn’t always true. Founded as Commonwealth Baptist Church in 1951, its congregation was once predominantly white. That changed as the church’s neighborhood changed in the 1980s and ’90s, when Briar Creek, also called Commonwealth Park, became a majority-black area. In the mid 2000s the church called its first African American pastor, and when he left a few years ago, Rev. Mannix Kinsey took up his mantle. Nowadays, Briar Creek is a racially mixed neighborhood. About half its residents are black, but it’s also home to an array of white and immigrant residents. Briar Creek Baptist shares its campus with a Nepalese congregation, among others. And Bob Lowman, director of the Metrolina Baptist Association, which includes the Briar Creek Church, told the Observer that the church is undergoing an “intentional transformation” to become still more ethnically diverse. The blaze on Briar Creek Road came just a week after a massacre at a black church in Charleston, S.C., left nine dead and the nation questioning how far it had come since the church burnings and bombings of decades past. During a spate of arsons across the South during the mid 1990s, six North Carolina churches were targeted, including one in Charlotte. Typically, those attacks were racially motivated, aimed at destroying the institutions that long served as havens from bigotry and headquarters for resistance. Pastor Mannix Kinsey told local television station WBTV he prays that this fire will not turn out to be a hate crime. But “the climate” right now makes him wary. The Charlotte Fire Investigation Task Force — which comprises fire department investigators, police detectives, an agent from the North Carolina Bureau of Investigations and a Bureau of Alcohol, Tobacco, Firearms and Explosives agent — has not released information about leads on possible motivations and suspects.